There are so many blogs out there that starting out in the blogging world can be a daunting experience. But actually, there are certain strategies for search engine optimisation (or SEO) that successful bloggers use to gain a competitive advantage. Whether you are blogging for business leads, or monetising your blog with advertisments, the rules are all the same. When writing your next post follow the blog SEO strategies below, and over time you will grow your search traffic, and a fan base at the same time. In order to create great content for a niche audience, you have to get to grips with what that audience really wants. Anticipating this takes an understanding of your niche, and keyword research. With the Google Keyword Planner tool, you can find keywords and phrases that your audience is searching for. Structure your content around these keywords and you are onto a winner from the start. Competitor blog posts with high numbers of social shares and comments are a great resource for you too! Look at what works well for your competitors and try and improve on it. Is the content informative or controversial? Does it have a catchy headline? The first glimpse of what is to come is in the title of your blog post. Appearing in search results is great, but you must make your title count to maximise the number of searches clicking through to your content. And, of course, use those all important keywords in titles in order to boost the chances of your blog post appearing on the first page of Google in the first place. Writing must read blog post titles can be a challenge, so here’s 74 blog post templates for inspiration. Usually the post url (or permalink) is generated from the post title. Be sure to drop filler words in your blog post url ie “the” “in” “a” to emphasis your keywords, and shorten it to a reasonable length. Yes, it is important to identify keywords and use them within your content. But it is also important to use them in natural way. Don’t stuff keywords into every paragraph and subtitle. Make use of synonyms to keep the content focused and interesting. Keyword Stuffing can harm your Google ranking and the user experience. A great tool for checking your keyword density in a visual way is wordle.com. As a minimum SEO blog posts should be 500 words. Long form content often performs better in search results. In fact, Google loves sites that create long posts (think 2000 words and more) and readers love long posts too. Not every post needs to be a Stephen King novel, but a few authoritative long form blog posts, can truly establish you as an authority within your niche. Good formating can emphasis particular keywords to google and make text much easier to read (or skim) for visitors. Use sub headings, bold text, and bullet points to break up text. Keywords and synomnyns should be used where appropriate for readability. Never publish a blog post without an image. Optimised Blog post images add keyword signals and visual value to your blog post. The first thing to consider for SEO is image file sizes. Images that are bigger than they need to be will only slow down your blog post loading time, a Google ranking factor. Descriptive image file names (usually your keyword or a synonym) help you and Google understand the content of the image. Don’t forget to replace spaces with dashes, and keep it short, no more than three words. For example s0001456.jpg is meaningless for search engines or visitors, while seo-guide-bloggers.jpg is more descriptive and not too long. Image Alt tags are used by screen readers for the visually impaired, and by Google to better understand the content of your images, so use a keyword or synonym here where appropriate. To keep readers on your site, create internal links to other blog posts you have created within your content. This will provide readers with an intuitive way of navigating your blog, allowing them to explore more of your great content. This internal linking is also a great way of giving your posts more SEO juice. If you have posts on your blog that have performed well, cross linking to related posts will share some of your successful post’s SEO power. This also works for linking to your product and service pages. Link out to authority websites in your niche to expand on your content. Google and your readers will view this as a positive. A rough rule of thumb is to create at least one internal and one external link per 500 words. Social media is a great way to promote and extend the reach of your blog post. Make it easy to share your awesome content using WordPress plugins for easy social media sharing . After you publish your new post, schedule to share it again in a few days time with different text. In your first share you might use the post title, then a quote from the post, or a question. Don’t forget to include #hashtags and customise the text or format for each social media platform. You cannot control who retweets you, nor can you control who gives you a quality backlink. What you are completely in control of is your own content, so make it awesome. Invest the time in creating high quality SEO blog posts and you will engage readers as well as Google. 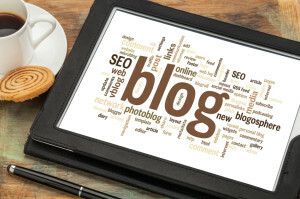 Great tips for optimising blog posts, Chris! I’ve been using these techniques on my comparison posts on my website, utilising the “versus” idea for page titles e.g “Coke vs Pepsi” to get progress attention. I have used this to generate traffic on my sites when comparing products and services, and the often one of the highest performing pages on my site.